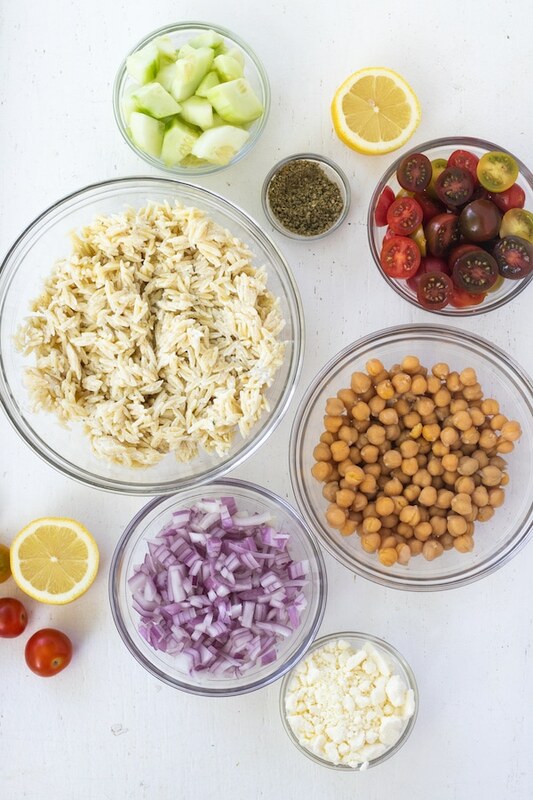 This Greek Orzo Salad is full of fresh, bright ingredients with Middle Eastern spices. A great vegetarian option for meal prep or potluck. 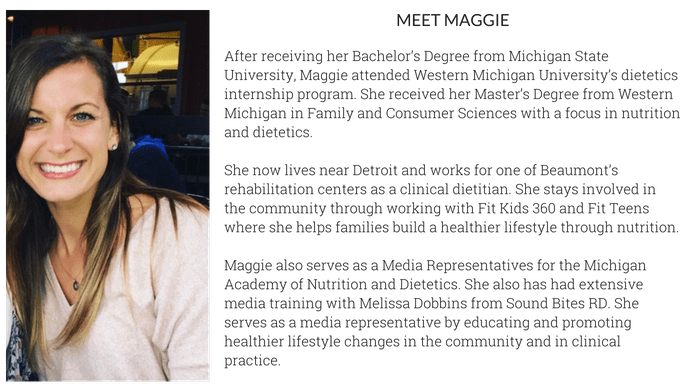 This past month has been a bit of whirlwind. I can’t believe it’s already mid to late September. In the past month I’ve had 2 bachelorette parties, one in Savannah and the other on Beaver Island. If you don’t know where Beaver Island is, it’s a 2 hour ferry ride from Charlevoix, Michigan. The population is approximately 500 people (on a good day). So needless to say, 10 girls on a bachelorette party kind of shook things up. 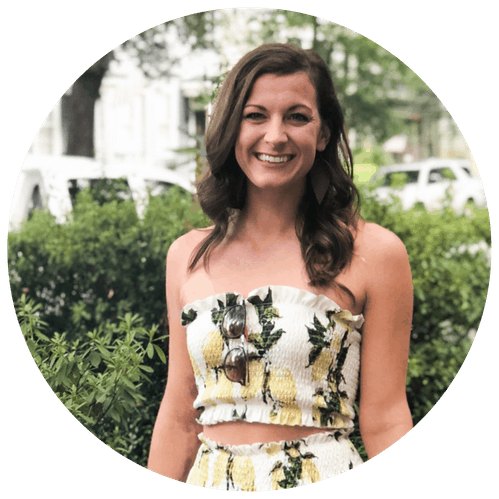 After the back to back bachelorette parties, Sean and I also went to Grand Rapids for a job interview and then up north to Lake Ann for a wedding. The weather in the second weekend in September has been BEAUTIFUL up north for the 3rd year in a row, plus there are way less people on the road and traveling. Win/win in my book. 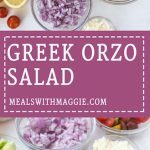 This week’s recipe is a Greek Orzo Salad because I’ve been needing some more vegetables and antioxidants in my life lately between all the pizza and beer! Not complaining by any means, I believe that you should enjoy the times you are visiting family/friends and traveling and not restrict or punish yourself for eating this or that. 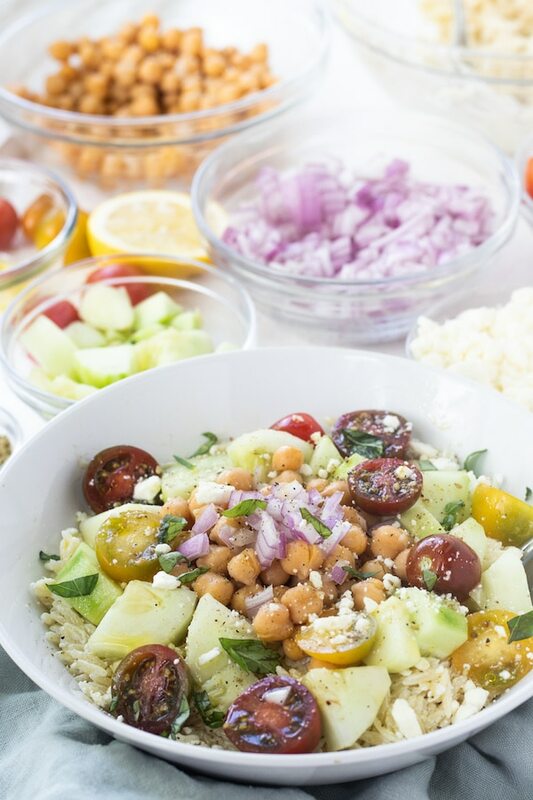 This Greek Orzo Salad is the perfect end of summer dish. With the official end of summer this weekend (tear) this salad needs some love before we shut out summer for cozy fall sweaters and pumpkin muffins (coming soon!). I made this salad last week for a get together and everyone enjoyed the fresh bright flavors. I found some multi-colored tomatoes at the farmers market and was dying to throw them into a bowl with cucumbers, feta, chickpeas, red onion and orzo. The best thing about this greek orzo salad is the za’atar. I first heard of za’atar from, The Lemon Bowl and I am so glad I did. Za’atar is a blend of Middle Eastern spices that you can find on Amazon or at a Middle Eastern market. If you live in the Midwest, most Meijers have it too. If you don’t have Za’atar, you could try using a blend of oregano, marjoram and sesame seeds but I guarantee if you buy Za’atar you will find other uses for it like on roasted chickpeas or on homemade pita chips. Greek yogurt: I used plain, 0% fat Greek Yogurt but feel free to use whatever plain yogurt you wish! Also it provides a nice probiotic and protein boost! Orzo: Did you know that orzo is actually considered a pasta? That means If someone asks you to bring the pasta salad to the potluck, you’re not cheating here ☺ Delallo has a gluten free variety too! Cherry tomatoes: In season and so tasty right now! 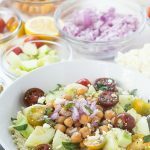 Cucumbers, red onion and feta: The ultimate trifecta for a Greek salad! Garbanzo Beans: Full of fiber, iron and phytonutrients. Chickpeas are also proven to help reduce the risk of heart disease. Olive oil: Healthy fats, antioxidant and another player helping to prevent cardiovascular disease. Combine orzo, yogurt and Za’atar in a large bowl. Mix in remaining ingredients, add lemon juice, drizzle olive oil and sprinkle with parsley and cracked black pepper. I used 0% fat plain greek yogurt. So fresh and flavorful! Great for lunches and easy to meal prep! It’s perfect for lunches ! Thank you Danielle!